(Sega All Stars) 200x $19.95 ? 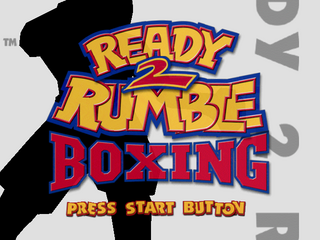 Ready 2 Rumble Boxing (レディ・トゥ・ランブル・ボクシング) is a boxing game and published by Midway for a variety of platforms including the Sega Dreamcast in 1999. The game is similar to Nintendo's Punch Out!, in that many of the boxers are comically designed. It was also one of the first games of its type to feature visible bruising and other facial damage as the fight progressed, something that saw much appraisal at the time of release. It was a launch title for the system in the west and was both critically and financially successful, making it into the budget Sega All Stars range and spawning a sequel, Ready 2 Rumble Boxing: Round 2. Ready 2 Rumble Boxing initially shipped with errors and so was actually released twice. Newer versions can be identified by the "Hot! New" logo. Main article: Ready 2 Rumble Boxing/Magazine articles.